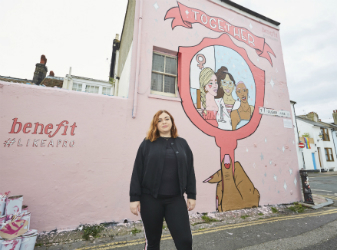 Benefit Cosmetics joined forces with Alice Skinner and a team of street artists to create two inspiring murals. The artworks celebrate the collaborative efforts of women, who support each other's 'brow-raising' actions and accomplishments. Alice Skinner, best known for her creative, vivid and storytelling style of work and most recently the illustrator of SHE; A celebration of 100 renegade women; designed the mural and street-paint for the first time with fellow creative women, at iconic street art destinations in London and Brighton. Alice said: "It made so much sense for me to partner up with such a vivacious and exciting brand, particularly on a project that champions women and celebrates the great things happen when women come together. This really is one of my most exciting projects to date!" Encouraging women to come together within these cities, the artworks are a work in progress via an interactive and collaborative event where Benefit followers had the chance to unleash their own creativity and contribute to the final masterpieces. Specially-designed "blank canvas" sections were left for Benebabes to add their own artistic stamp and share motivational and supportive messages for other women, or simply add a star to represent someone who has empowered or inspired them. With the uniting thought behind the pieces proving that "when women come together, they create wonderful things", they will be displayed in their glory - up to 23ft high and 52ft wide - throughout September 2018.